Moses had just received one of the greatest commissions in history. He was to be God’s instrument to deliver the nation of Israel and to guide it to the Promised Land. He was to lead them to become a kingdom of priests and a holy nation (Exod. 19:6). Yet Moses had not obeyed all of God’s commands himself, for he had never had his son circumcised. This was a long-standing command from God that Moses had ignored. God’s response was to prepare to kill Moses. Here was one of history’s greatest men about to be put to death before ever performing the task God had set before him. 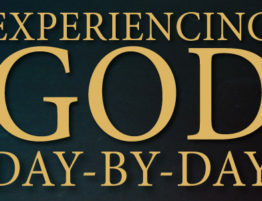 Moses could not expect to blatantly ignore a command of God and still be used mightily in His divine work. Had not Moses quickly responded in obedience, he would surely have lost his life. Moses learned that God makes no exceptions for holiness. When God sets forth a requirement of His people, He most certainly demands it of the leaders. God wanted to make Moses’ life a highway of holiness through which He could bring redemption to millions of people. God had to make some significant adjustments in the life of Moses before He would use him to lead His people. Are you trying to serve God and yet ignore something He has told you to do? Are you living your life as if God does not notice your disobedience? Do you apply God’s standards to yourself as rigorously as you apply them to others?